Let’s start with what an atom is, which is is the fundamental stuff that matter is made of, everything except energy, in the universe is made up of atoms. 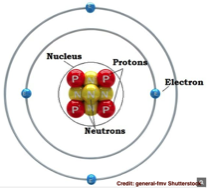 An atom is comprised of three particles; neutrons, protons and electrons. 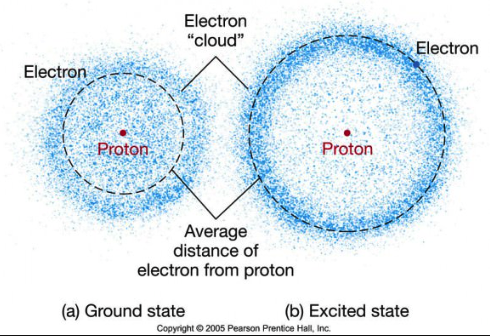 The neutrons and protons form the center or nucleus of the atom, while the tiny electrons fly randomly in a cloud like pattern around the nucleus. The electrical charge of the nucleus is positive (due to the protons) while electrons are negatively charged, and thus they attract each other and, like magnets, stick together. To the left is the structure of a beryllium atom. It has four neutrons, four protons and four electrons. Electrons are extremely light (have low mass) while protons and neutrons are much heavier. Notice how the elections are arranged in different “orbits” around the nucleus. Beryllium has its electrons flying in two orbits, or at two distances from the nucleus. These are called “shells” because the electrons fly randomly about the nucleus, but they stay close to their assigned distance from the nucleus. Also, notice that they are arranged in pairs to balance each other. This “pairing” is going to be essential to understanding what a free radical is later on. Add or subtract a proton and you create a new element. Beryllium has an atomic weight of four because it has four protons. Carbon atoms have six, oxygen has eight, gold 79 and uranium 92. Aluminum is much lighter with 13 protons per atom as compared to lead with 82 with protons per atom. There are 103 known elements. Here’s a good article about the elements and the periodic chart that organizes the 103 known elements. Electrons have almost no mass or weight at all and are 18,000 times smaller than a proton. Protons are positively charged particles that are slightly less heavy than neutrons, which have no charge. All atoms except the lightest (Helium which as an atomic weight of 1) have neutrons. The number of neutrons in a nucleus determines the “isotope” of type of that element. For example hydrogen has three isotopes; protium, deuterium and tritium. You may have read or seen movies and TV shows about the Nazi’s in world war two seeking “heavy water” from the Norwegians. This is water made up deuterium (an isotope of hydrogen) and oxygen (D2O) called deuterium oxide (an oxide has oxygen in it) that was and still is used in nuclear reactors. In nuclear fission, the nucleus of an atoms fissures (splits) into smaller fragments along with two or three lose neutrons. The weight of these fissured particles are about 0.1% less mass than the original nucleus–that tiny bit of mass over many atoms is converted to energy giving you heat (when controlled) or an explosion when it is uncontrolled and a chain reaction sets off. by the “strong force” which is one of the four types of forces known in nature. According to Wikipedia, the strong force is 137 times as strong as electromagnetism, a million times as strong as the weak interaction (between sub-atomic particles within protons) and a stunning 10 to the 38th power times as strong as gravity. There is a lot of energy holding the nucleus of an atom together, and splitting (fissuring) atoms can release enormous amounts of energy. Electrons “orbit” around the nucleus. 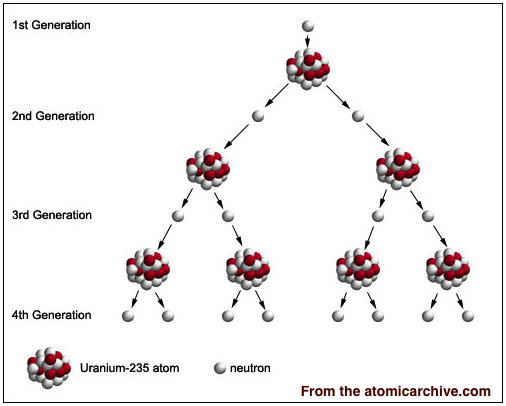 The Bohr diagram above of an atom is not accurate with respect to how electrons move around the nucleus. While electrons maintain different orbit levels around the nucleus they don’t orbit the nucleus like the Earth does around the Sun. Instead they randomly move about in a cloud-like pattern, so we call the orbit a “shell” which is more descriptive. Werner Heisenberg found that one cannot know the position and the velocity of an election at the same time. The electron is unpredictable but they are always arranged in orbits or different shells, at different distances from the nucleus. Electrons typically exist in pairs in their shells, they balance each other and should an atom lose one of a pair it becomes unstable. If losing an election results in an unequal match between the number of electrons in total vs. the number of protons in the nucleus, the atom becomes a charged “ion.” A lightning strike is preceded by a generation of a strong electric field around a cloud. This strips electrons from air making it easier for additional electrons to move about or “react” and also provides a good conductor of electricity. This “ionized” air becomes an excellent electric conductor which is called a plasma which is created when oxidation (i.e., when an atom or molecule loses an electron when combining with oxygen) occurs. The built up charge in the cloud then uses this conductive air to discharge to ground. When the “bond” between a pair of electrons is cleaved that creates two separate entities, each of which winds up with an unpaired electron and they become highly reactive. They react with one another or with single atoms that carry extra electrons. This process happens constantly allowing chemical reactions in everything we see, touch, hear or know. In fact, these chemical reactions based on trading electrons are essential to the chemical process called metabolism, converting air and food into chemical energy, thus allowing life. So a neutral, stable, atom has electrons in pairs (an even number) and the number of electrons must match the number of protons. A radical has one (or more) unpaired electrons and it has at least one unpaired electron flying in an shell. The radical atom differs from an ion in that even though it is missing an electron, it still has the same number of electrons as protons–thus it has no charge. Still, they are highly reactive and become stabilized only when they gain an electron. A free radical is the same thing as a radical, there is no difference except free radical is the original and proper name.